Duct tape is poly-coated, industrial-strength tape with high-tack adhesive. Easy-to-tear tape is made of a waterproof polyethylene film with a polyester/cotton blend cloth carrier. Tape will not twist or curl during application and bonds where other tapes won't, including to recycled fibers, dust, hot and cold surfaces, and heavy loads. 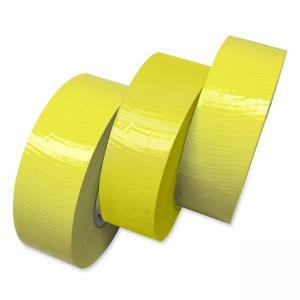 Use tape for general-purpose HVAC use, packaging, sealing duct work, and for adhering cable to carpet or floors. Tape has a 9 mil thickness.